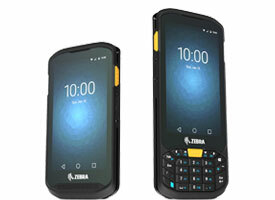 The Zebra TC20 / TC25 Android Mobile Barcode Scanners are a new small business tool giving you everything you need to be more successful in your mobile deployments. You get the right looks, and the right business features you need to save time and money, increase sales and boost profitability – All at the right price. The result is the ability to take inventory at record speeds, the instant information you need to keep items your customers want on shelves and the ability to answer shopper’s questions on the spot increasing loyalty and return visits. The TC20 / TC25 from Zebra – the small business tool done right. 4.3" Screen, SE2100 1D/2D Imager, 802.11 a/b/g/n/ac/d/r/h/I, Bluetooth 4.2 BLE, No Camera, 2GB RAM / 16GB Flash, On Screen Keypad, 3000 mAh Battery, Android 7.0 Nougat OS. 4.3" Screen, SE4710 1D/2D Imager, 802.11 a/b/g/n/ac/d/r/h/I, Bluetooth 4.2 BLE, 8MP Rear Camera, 2GB RAM / 16GB Flash, On Screen Keypad, 3000 mAh Battery, Android 7.0 Nougat OS. 4.3" Screen, SE4710 1D/2D Imager, RFID Ready, 802.11 a/b/g/n/ac/d/r/h/I, Bluetooth 4.2 BLE, 8MP Rear Camera, 2GB RAM / 16GB Flash, On Screen Keypad, 3000 mAh Battery, Android 7.0 Nougat OS. 4.3" Screen, SE4710 1D/2D Imager, 802.11 a/b/g/n/ac/d/r/h/I, Bluetooth 4.2 BLE, 8MP Rear Camera, 2GB RAM / 16GB Flash, Numeric Keypad, 3000 mAh Battery, Android 7.0 Nougat OS. 4.3" Screen, SE4710 1D/2D Imager, 802.11 a/b/g/n/ac/d/r/h/I, Bluetooth 4.2 BLE, GSM, ATT LTE/WCDMA, GPS, 8MP Rear Camera, 2GB RAM / 16GB Flash, On Screen Keypad, 3000 mAh Battery, Android 7.0 Nougat OS.